BioWare has come up with another free goodie for Mass Effect 2 fans: The Arc Projector, a new heavy weapon that can lay waste to an entire enemy squad with just a few pulls of the trigger. You have to give credit to BioWare and EA: They're pulling out all the stops to make Project Ten Dollar a success. That, for those who haven't been paying attention, is EA's plan to reduce pre-owned game sales by offering free bonus content to people who buy new; in the case of Mass Effect 2, that would be the Cerberus Network and all the DLC that goes along with it, from notorious bounty hunter Zaeed Massani to the Hammerhead hovercraft, part of the upcoming Firewalker pack. To that already impressive collection, BioWare has now added the Arc Projector, a new gun it unveiled today. 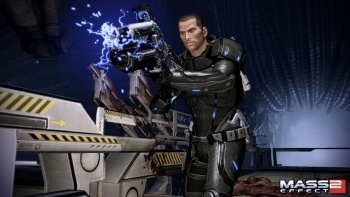 BioWare's Mass Effect Arsenal says, "The Arc Projector ionizes targets with a non-visible laser to ready them for a high-voltage electrical attack. As the lightning-like bolt hits its first target, a sophisticated auto-targeting system paints succeeding targets with the ionization laser, allowing the electricity to take the path of least resistance and arc between them. An entire enemy strike team can be shocked to death with a few pulls of the trigger." That's a lot of gun. The Arc Projector is available now, free to Cerberus Network members; if you don't happen to be in that club (which is to say, if you bought the game used) you can sign up for it directly from EA for $15.